The region is a small mountain range that runs mostly north and south on both sides of the main road from Nalaikh to Baganuur. Elst Uul (which means Sandy Mountain) is the highest point on the south side of the road. It is about four to five km off the road. The trails are a random network of two track (not double wide) and some singletrack both etched into the landscape primarily by the local herdsmen and illegal wood cutters. Some of the track is still used enough to be maintained as two track. Some of it has reduced to singletrack due to a lack of use. Most all of it is great for riding. This is classic cross country riding in the Mongolian wilderness. There are trails to be explored running pretty much in all directions across the range. Bring satellite images and a compass and enjoy the adventure. The climbs are big but pretty much completely rideable if you are in good enough condition. The descents are FAST and mostly three to six miles long. The trail mileage listed (40 miles) is purely a ball park guess and probably a conservative estimate. 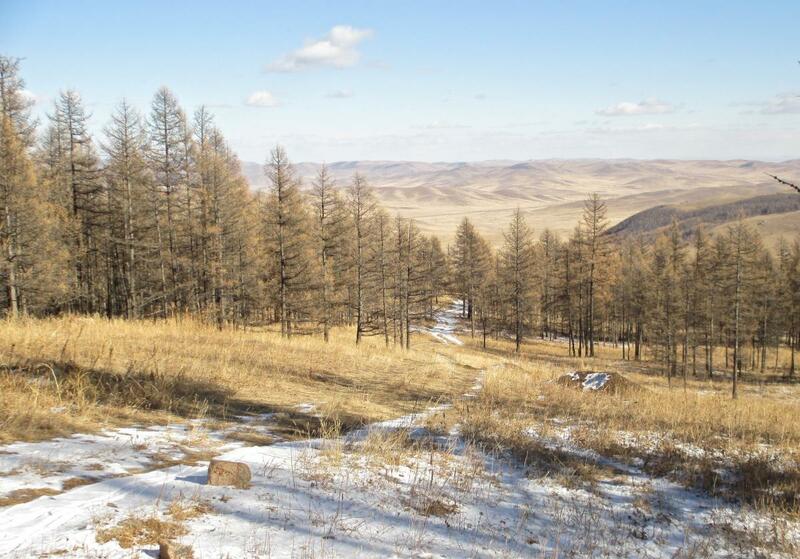 Review: This forest is the southern most extent of the northern coniferous forests of Siberia. South of this mountain is all desert across Mongolia and well into China. So this is important forest habitat for migrating birds, including migrating eagles, kites and other raptors. It is also important habitat for a small resident wolf population, deer, fox, many small mammals, and many species of song birds. The peaks are not so majestic, but the slopes and vistas are beautiful nonetheless. Review: As a cross country ride, I would rate the trails a five. There is good distance here to ride, the trails are fun, and the wilderness experience and scenery are both fantastic. Overall, the difficulty (technically) is probably an easy intermediate at best. There is not a lot of tech or gnar on the trails, but you can find techy spots to play around on and session on. In terms of strenuousness and remoteness, these trails are intermediate and more. The climbs are big and long. Descending is blazingly fast, and thus, increase the risk of a serious injury. It's best not to ride here alone and be prepared to overnight in the forest in case something went wrong. Belying its name, the trails are not sandy at all. Most trails are either covered with a little grass or a firm surface of dirt (not very organic). Elst Uul MTB Trail 5.00 out of 5 based on 2 ratings. 2 user reviews.